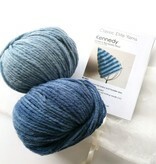 Welcome that new baby into this world by knitting a them cozy and warm Kennedy Elf Hat for their head. 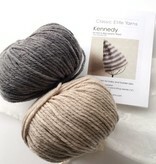 The Classic Elite Yarns Kennedy Kit includes enough Big Liberty Wool yarn to knit a hat for either a baby or a toddler. No need to stress about choosing the perfect stripe color combination because Classic Elite has created combinations for boys, girls and gender neutrals. 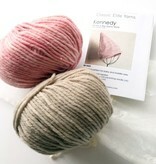 Kit includes paper pattern and two balls of machine washable Big Liberty Wool in contrasting colors. Needles and stitch markers not included.